Regnerus Opus Dei is not an obscure religious order. However, Mark Regnerus is the author of a seriously flawed study on gay parenting and that study was funded by an Opus Dei organization. In other words a secretive Catholic order funded a study used by NOM (which is a proxy for the US Conference of Catholic Bishops) in an attempt to discredit gay parenting in advance of four ballot contests in November. As Andy Birkey noted, Witherspoon Institute forked over $695,000 to pay for this "research" and they got what they paid for. Witherspoon is an Opus Dei organization founded by Robert George and Luis Tellez. The operation is run by Tellez who is an Opus Dei numerary. Numeraries are celibate members who usually live in special centers run by Opus Dei. George is also a founder and Chairman Emeritus of National Organization for Marriage; Tellez has been on NOM's board since inception. Furthermore, NOM used office space in Princeton that was shared with Witherspoon. Witherspoon frequently publishes anti-equality polemics on their Public Discourse website. Witherspoon even created a separate website solely to promote the Regnerus conclusions. 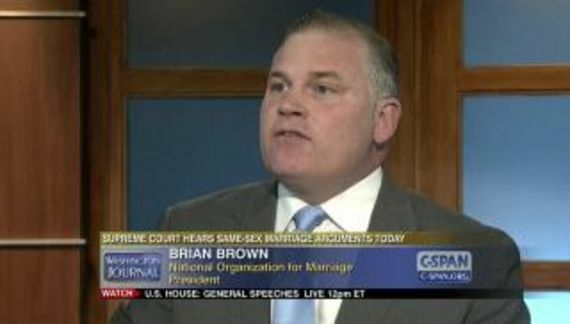 In May of 2011 Regnerus was lecturing the Heritage Foundation on the evils of birth control. This guy has an agenda and it is clear who authored it. What the study shows, then, is that kids from broken homes headed by gay people develop the same problems as kids from broken homes headed by straight people. More importantly, this is a diversion that has nothing to do with marriage equality! I am going to restate what I have written many times. The status of marriage equality has absolutely nothing to do with parenting. Whether gays can marry or not, the same heterosexual couples will unite in the same marriages, crank out the same kids and sue for the same divorces. Similarly, the same gay couples will adopt the same children. Even though the research is vastly on our side, if we get into debates over parenting we will lose all four ballot initiatives in November. The worst thing that we can do is to engage in a battle of dueling experts notwithstanding the incomparable gravitas of the APA. Parents who make up the majority of the electorate will choose the path of least impact which is always the status quo. Call this challenge for what it is: baloney that has nothing to do with gay marriage.